Of the seven people who had signed up four of us met on the Riverside and one more joined at Polesden Lacy. (The remaining 2 cycled to Polesden Lacy but didn’t identify our group). It was sunny all day and the scenery was marvellous. 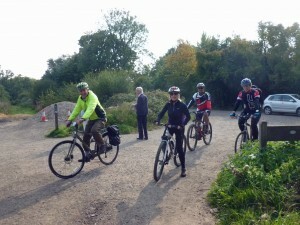 With a dry surface in the commons and well-matched riders we made good time and were back in Twickenham by 3pm.